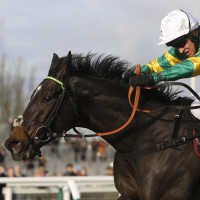 Le Prezien was produced to perfection by Barry Geraghty to bring the curtain down on the Cheltenham Festival with victory in the Johnny Henderson Grand Annual Challenge Cup Handicap Chase. Gino Trail set sail for home a long way out and was still in front over the last despite being hampered by loose horses. But he had no answer to the late challenge of the JP McManus-owned Le Prezien (15-2), who powered up the hill to score by four and a half lengths. Gino Trail's trainer Kerry Lee also saddled the third Top Gamble, who was a neck away. Theinval was fourth. It was a double for trainer Paul Nicholls following the victory of Pacha Du Polder in the Foxhunter Chase. "He had a long time off and it took us time to get him right. We were aiming him for this meeting whichever race we ran him in."